This summer, SkyTruth began monitoring bilge dumping “hotspots.” I focused my monitoring efforts in the coastal waters surrounding the United Arab Emirates and Oman or the “tip” of the Arabian Peninsula. I began by visiting the European Space Agency’s datahub (and USGS) daily and downloading tons of imagery. The downloading of imagery was tedious and time-consuming. Using Google Earth Engine, we created scripts to input an AOI and automatically queue up all the imagery in a specified date range, which is easy. But Earth Engine has a lag time ingesting new imagery from various satellites, so I still need to manually download from ESA’s data hub to obtain the most recent imagery. I customized different versions of the script with different AOIs covering the coastal waters I wanted to monitor. 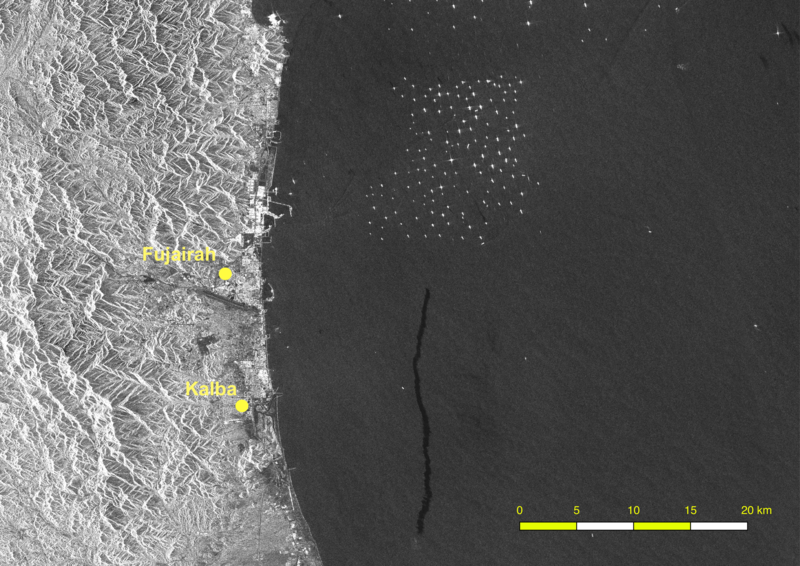 The remnants of a likely bilge dump (dark streak) possibly from a vessel traveling north to a tanker “parking lot” (the cluster of dozens of bright spots, each representing a vessel at anchor) off the coast of United Arab Emirates. Bilge is an oily liquid that accumulates in the bottom of the hull, and vessel operators will sometimes just dump it overboard. If the vessel is moving while bilge dumping, then the slick appears on radar satellite imagery as a long, skinny, black line. 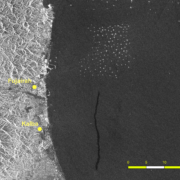 But if a vessel releases the fluid while anchored then the slick can appear as an irregular black patch. There are examples of both above and below. Sometimes the vessel would still be in the range of its environmental “gift.” Then we could report on that vessel as the likely culprit evidenced by satellite imagery. Satellites don’t lie. 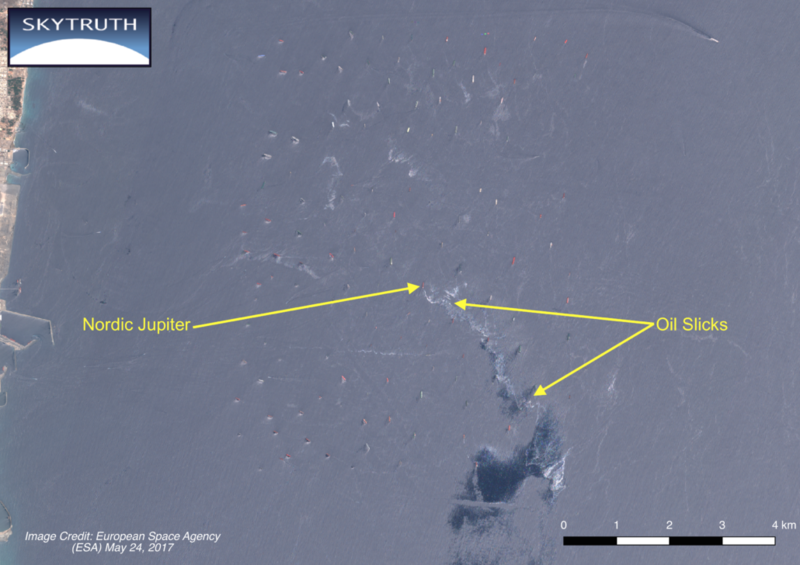 The Nordic Jupiter, a crude oil tanker, anchored offshore Fujairah in the United Arab Emirates, and located at the likely source of an apparent oil slick, suggesting a leak or possibly intentional bilge dumping. Much of my time was spent on the Google Earth Engine surface mining identification process, which involved using Landsat satellite imagery to create a composite of only the greenest pixels from each year’s summer months and creating a NDVI band from that composite. The purpose was to identify bare rock and soil typical of active strip-mining operations, like mountaintop removal mining (MTR) to extract coal. The Normalized Difference Vegetation Index (NDVI) is a ratio of a pixel’s red value to its near-infrared value. Vegetation absorbs most visible light but reflects the infrared, while bare surfaces reflect both. A low NDVI value indicates a bare surface and a high NDVI value indicates healthy vegetation. By masking out all urban areas, streets, railroads, etc., the only large bare surfaces left in our Appalachia study area are large-scale coal mining operations. This process requires a lot of satellite imagery. To accomplish this, I used Google Earth Engine, a cloud-based platform with access to satellite imagery collections and various geospatial datasets, including the entire archive of Landsat images going back into the early 1970s. In central Appalachian states like West Virginia, mountaintop removal is the process of removing the several top layers of rock to expose coal seams. It is a resource-intensive process that results in massive landscape change. As much as 85% of federal coal comes from Wyoming and Montana, specifically the Powder River Basin. My job was to attempt to adapt our process designed around Appalachia to the flat, dry shrublands of Wyoming and document the results. The first step was creating a new area of interest (AOI). In Wyoming, the Powder River Basin spans two counties in Wyoming (Converse and Campbell), and those county boundaries formed the study area. The next step was creating the mask to eliminate areas that we didn’t want to analyze. That process involved downloading GIS shapefiles for hydrology (lakes/ponds, rivers/streams), urbanized areas, roads, railways, and oil & gas drilling sites. Shapefiles are georeferenced to represent these features on a map accurately. To create the mask, these shapefiles were merged and converted to a binary image. We could exclude these elements from the analysis because some were misidentified as active mining. Annual progress of landscape disruption caused by coal mining at the Black Thunder coal mine, WY, from 1985 (green) to 2015 red) overlain on 2015 aerial survey photography (NAIP). 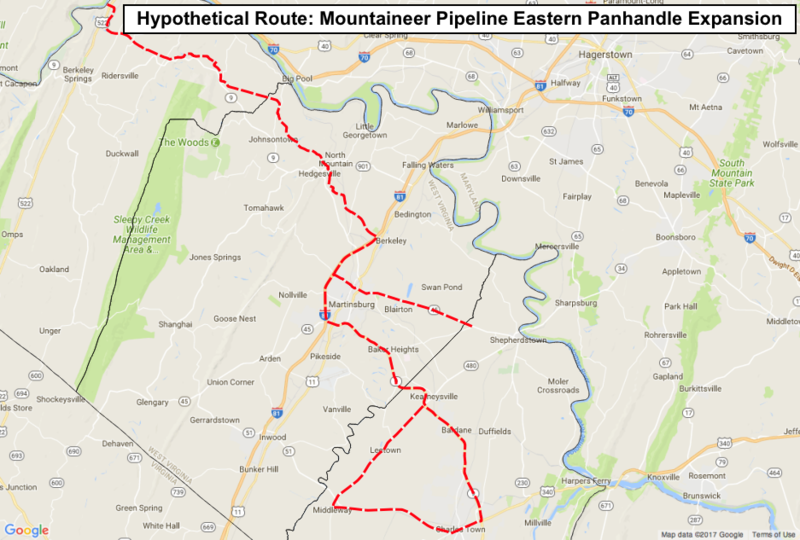 I also worked with Tracy Cannon of Eastern Panhandle Protectors on Mountaineer Gas Company’s proposed pipeline across the Eastern Panhandle of West Virginia. A very rough, general path for the pipeline had been published, but the particular route is not being shared by the company or state regulators. To give the public a more precise view of the pipeline’s likely route, Tracy visited county courthouses and gathered publicly available information about easements purchased by the gas company on dozens of properties in the area. She shared that information with us. We combined it with a public GIS layer for tax parcels that includes the outlines of residential and commercial properties. By using Google Earth to view all of the properties that had sold easements to the gas company, a more detailed pipeline path began to take shape through Morgan, Berkeley, and Jefferson counties. I discussed some assumptions about pipeline construction with the Protectors (to minimize construction costs a pipeline will take the shortest route between two points, but will also avoid sharp turns and steep slopes, excessive road and stream crossings, and when possible will keep clear of homes and other structures. With that in mind, I analyzed the Google Earth imagery and manually traced what I considered to be the likely pipeline path through our own Eastern Panhandle. The map shown below is our “best guess” based on the easement information provided by Tracy, and the very crude maps made public by Mountaineer. The hypothetical Mountaineer pipeline path (dashed red line) overlain in Google street-view. The proposed pipeline enters Morgan County at upper left across the Potomac River and continues through Berkeley and Jefferson County. My time as a SkyTruth intern was divided among a diverse set of projects, and it was certainly well spent. I’ve garnered an in-depth understanding of GIS and satellite imagery processing, map-editing, and worked in a team environment to accomplish complex tasks. Satellite images offer so much more than their beauty. I conclude my time at SkyTruth a true believer in the power of satellite imagery for environmental conservation. If you can see it, you can change it!